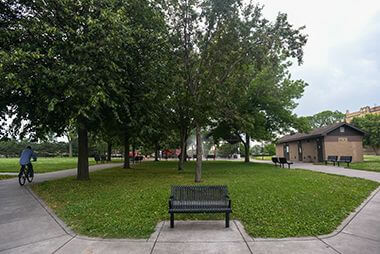 Franklin Steele Square	One of the Minneapolis park system's oldest parks, offering recreational opportunities for all ages. Wading Pool is a splash park. The land for the park was donated to the city in 1882, prior to creation of the park board, by the daughters of Franklin Steele: Mary C. Morris, Catherine B. Steele, and Caroline H. Addison. 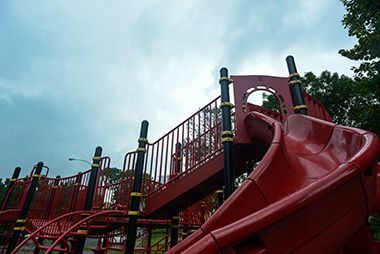 A condition of the donation was that the city appoint Charles Loring to supervise improvements to the park, a condition that both the city council and Loring accepted. The ownership of the park was transferred to the park board by the city council April 27, 1883. A fence around the park was constructed in 1883 and in 1884 trees and shrubs were planted and an asbestine sidewalk was laid around the park. New walks were laid, some redirected, in 1906. In 1912 the park board approved a plan submitted a year earlier in the annual report to improve Franklin Steele Square, including creating space for a small children’s playground along 17th Street. In 1916 the school board requested use of the park as a playground for Madison School across the street, but the park board determined that such a use would violate the spirit of the conditions of the original donation of land and denied the request. 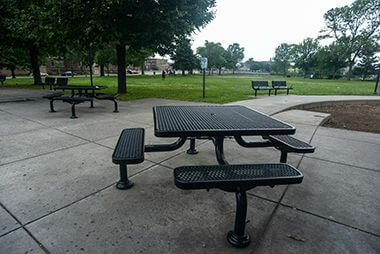 The issue was revisited in 1948 when the park board approached the heirs of the donors and restrictions on the use of the park were removed so the park could be integrated with Madison School by the vacation of 16th Street. Plans included a wading pool, a children’s play area, a small athletic field and picnic facilities. Franklin Steele Square lost 0.14 acre in 1962 to freeway construction. The land lost was not as significant as the fact that freeways on two sides of the park isolated it from parts of the neighborhood it had once served. A “totlot” playground for small children was added to the park in 1975 and upgraded in 1990, when the park was renovated. In 2006, the aging shelter was removed. The park was completely rebuilt in 2008-2009. 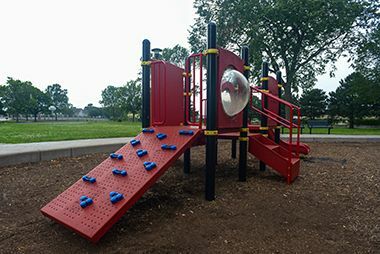 A new “splash park” and playground equipment were the main features of the new park, but renovations also included a new picnic shelter with tables, benches and grills. Despite their generosity in donating land for a park before the park board was created, the daughters of Franklin Steele put up a fight when the city and the state wanted more of their land for parks. The sisters owned land near Minnehaha Falls that was taken by the park board in condemnation proceedings in 1889 when Minnehaha Park was acquired. The daughters contested the condemnation awards in court, but lost their challenge and a portion of their land was incorporated into Minnehaha Park. 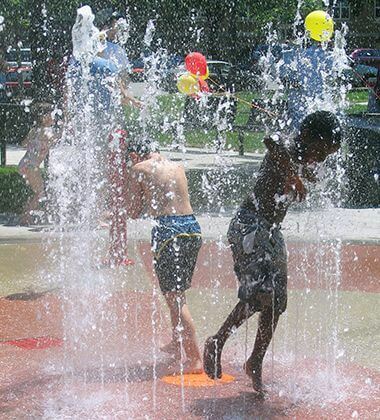 Cool off in the summer at the Franklin Steele Square Wading Pool. See our other wading pool locations. Practice your shot, or your one-on-one on these half-courts. 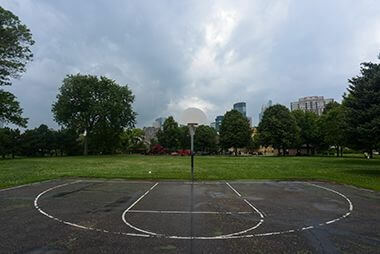 If you're looking for a full-court game just head to Elliot Park. One of Minneapolis' oldest parks, the land for Franklin Steele Square was donated in 1882. 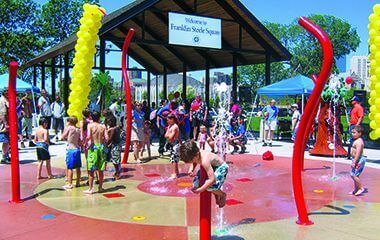 Frankline Steele Square features both a full size playground and a tot lot for the smallest family members.